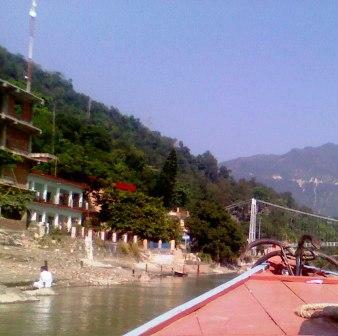 Rishikesh is situated 25 kms ahead from Haridwar city and located at the elevation of 335 mts from the sea level. Rishikesh is also one of the best pilgrims center. Rishikesh is well known for Best Yoga Center in the world. Today the Rishikesh is becomes a good center for Yoga and meditation and research center for them. White water River Rafting is one of the best popular activity in the Rishikesh and it is also ideal destination for many other adventures sports like trekking, rock climbing, mountaineering, Bungee-jumping and other. Ram Jhulla Bridge: - Ram Jhulla Bridge is one of the hanging bridges in Rishikesh, which connects Swarg Ashram and Shivananda Ashram which is also a main attraction of Rishikesh. The bridge name is taken from the name of Lord Rama. Laxman Jhulla Bridge: - Laxman Jhulla Bridge is also a hanging bridge in Rishikesh. It is approx 445 ft long bridges over Ganga River and it was built in 1939. The Bridge is named on the Lord Rama Brother Laxman. Triveni Ghat: - Triveni Ghat is one of the holy and sacred Ghats in rishikesh on the bank of the River Ganga; you can visit here evening prayer that is very attractive and amazing. Other Places are 14 Story Temple, Geeta Bhawan, Sachha Akhileshwar, Laxman temple, Adi Badrinath temple, Parmarth Niketan and etc. By Roads: - Rishikesh is well connected by roads from other cities and states. By Trains: - Rishikesh is also well connected by Trains from Other Trains station. By Air: - Nearest Airport is Jolly Grant Dehradun, distance is 15 Kms. For any types of trade query and any question about this post kindly tell to us at onlineuttarakhand@gmail.com.